Have you ever done that annoying thing where you put down your Dreamcast controller and then inadvertently pick up the controller for your PlayStation 4, try to resume your game of Spirit of speed 1937 and then realise you've grabbed the wrong peripheral? I can tell you, this happens to me a hell of a lot, especially since Spirit of Speed 1937 is my favourite game ever and I play it every day for at least 15 hours. If you're like me, this news will come as a pleasant surprise - soon you'll be able to connect your Dual Shock 4 or Dual Shock 3 to your Dreamcast thanks to peripheral manufacturer Brook Accessory. My consumption of Spirit of Speed 1937 will probably increase exponentially due to this. Send help. 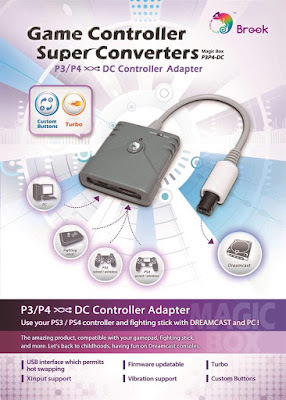 The 'Game Controller Super Converter' allows your to plug PlayStation 3 and PlayStation 4 controllers into the Dreamcast via USB and also allows for fight sticks to be used. Obviously, the Dual Shock controllers don't have VMU slots so you'd probably need to stick a regular Dreamcast controller into port B to access saves etc. We've been able to use Dual Shock and Dual Shock 2 (and even Sega Saturn controllers) with the Dreamcast for a while now via the Total Control adapter, but any new technology for the Dreamcast is certainly worth looking at. Update: this device *does* actually allow for wireless connectivity once the controller has been registered with a USB connection, but as stated a second wired controller is needed to access VMU saves etc. It’s promising that more companies are willing/able to do this given the unique nature of the DC’s controller situation (VMU, port hosts internal battery, etc.). I love the Dreamcast but the OEM pad really starts cramping my hands around hour 2 or 3 of my routine, marathon Soul Fighter play sessions. The Dual Shock 4 is a great step in the right direction but hopefully future revisions of this unit can include VMU ports (a la Total Control). Bring on all the controllers, I say! I just bought, though it hasn't arrived yet, a Brook Xbox 360/Xbox One to PS4 adapter so I can use my Hori Real Pro V Kai on my PS4. I wonder if I can use that adapter with this controller adapter to use that stick with my Dreamcast. It would be more interesting a broadband adapter and a HDD for Dreamcast. Expect a spike in value with The Spirit of Speed once this is released as it's literally the only thing that game is missing! I would not pay $40 dollars for this. People who play Dreamcast want wireless controllers. You still have to use a USB cable with this. Pointless. @stillbulletbrad, it says PS4 controller /wired/wireless on the advert. So assuming that is true, you will be able to play wirelessly, not pointless. It says via USB cable in the description. Don't be fooled. That's just describing the controller. It says you have to connect your controller via usb the first time to register the controller then after that it will automatically connect wirelessly. check their website http://www.brookaccessory.com/detail/47613739/. The only thing is no vmu so I don't know how you can save your games. Not me and most anyone that plays fighting games. I want to be able to use my newer fight sticks. Wireless means nothing. As what Eric Cannon says, you have to pair the controller with the receiver first and then voila, wireless controller functionality.